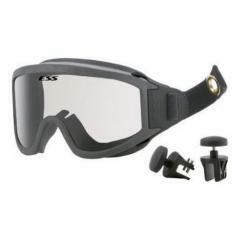 The ESS Innerzone 1 goggles feature a patented semi-permanent strap and mounting system that allows the goggles to be stowed on the front or rear of a helmet. Designed to withstand the rigors of structural collapses and other hazardous situations that demand primary eye protection, the Innerzone 1 is fully NFPA compliant, including the 500 degree for 5 minute NFPA oven test. Patented semi-permanent mounting system allows goggles to be stowed on front or rear of the helmet, ensuring that primary eye protection is always close at hand. High heat-resistant mounting brackets carry a lifetime warranty and securely attach to helmet brim, no drilling required. Mounting bracket thumb screws secure strap to helmet. Functions well with all major structural firefighting helmet designs. Strap SystemTwo-piece strap system is made of 26mm-wide, high-memory woven Nomex. Patented SPEED CLIP strap system makes strap adjustment quick and easy, even with gloves on. Frame is made from high heat-resistant materials. Full-perimeter ventilation and filtration system prevents lens fogging while filtering out dust, smoke, and particles. Fits comfortably over most prescription eyewear.